I ignored Issey Mikaye’s A Scent when it came out. I was happily immersed in niche and vintage sampling then, trying all I could of the latest darling releases: Andy Tauer sample sets, Parfum d’Empire, Parfums de Nicolai … Lutens … the latest Chanel Les Exlcusifs … I practically camped outside the letter box waiting for L’Artisan Traversee du Bosphore to be delivered (it didn’t work for me sadly), and a gift of a bottle of vintage Miss Dior was a thrill beyond words. A Scent never stood a chance. I tried department store testers but tended to agree with reviewers who generally seemed underwhelmed. A Scent opens with a tang of citrus followed quickly by a realistic evocation of hyacinth, very bracing, but not as bitter as actual hyacinths can smell. After that the fragrance relaxes and I smell mixed clean green florals over a gentle base of musk (not listed as a note). Longevity is good and sillage moderate. I wore it on warm day during a long car journey and found it a refreshing but gentle presence over several hours, with nothing to offend my fellow travellers. The hyacinth is what pleases me about A Scent. I recognise it distinctly but it is not as heavy as the other hyacinth perfume I know well, Guerlain Chamade. 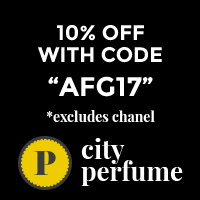 A Scent is frequently compared to other great classics, Chanel Cristalle and No 19, and not favourably. ‘Nice, but not as good as … ‘. But many people would find A Scent easier to wear, I think. It is green all the way through but without sharpness or bitterness, and anyone worried about dirty moss or wet stones need have no concerns here. It reminds me a bit of Estee Lauder Pure White Linen but without the herbal shampoo accord that makes PWL a bit banal for me. Miyake reportedly does not like fragrance and this one is said to be inspired by the smell of Japanese mountains. It smells clean and cool, damp but not watery, and conforms with Miyake’s minimalist aesthetic. A Scent is not a masterpiece, but if it sounds like your thing, grab it while you can. Yes – it’s discontinued, but widely available at the online discounters. There’s a pink flanker, A Scent by Issey Miyake Eau de Parfum Florale. That one is still on the market but I have not tried it. Do comment if you have. Green fragrances can be tricky to wear. Do you have a favourite? Gucci Envy – yes! Though again, A Scent is probably a bit easier to wear. A Scent is worth having in good quantity because it’s the sort of thing you reach for often. Somewhere in my collection I have a bottle of A Scent. I will go looking for it tomorrow. Sounds like a perfect heat beater. I like some green florals like Floris Zinnia, Odona Adees Fragrance of Scottish Heather, Leonid des Lescinski Eau de Fleurs, Serge Lutens A La Nuit, i Profumi di Firenze’s Caprifoglio and Incanto, but usually am not a fan. I find them okay, like Hermes Hiris or i Profumi di Firenze’s Iris di Firenze. Although I love jammy roses best, I do like a good green rose. I also like but don’t love Imaginary Author’s The Soft Lawn, which smells like grass. That’s about as green as it gets. You and I have opposite tastes then, because I dislike jammy roses. Soft Lawn sounds nice – I should check it out. A more extreme version of that might be Chanel’s Bel Respiro, which smells like cut grass too but VERY green. No ray of sunshine anywhere.